“So you wanna be an Ultimate Fighter?” How about a K-1 Kickboxer, instead? The world’s premier kickboxing organization announced Tuesday it will hold its first ever open tryouts at the famed Muscle Beach in Los Angeles, California on Thursday, July 19th starting at 1PM local time. K-1 is offering the unprecedented opportunity for contestants to fight in a 2012 event and the chance to compete for $2 million in prize money. One million will be awarded to the 2012 K-1 Heavyweight Grand Prix winner along with $300,000 for second place, as well as $300,000 for the winner of the 2012 K-1 MAX tournament. 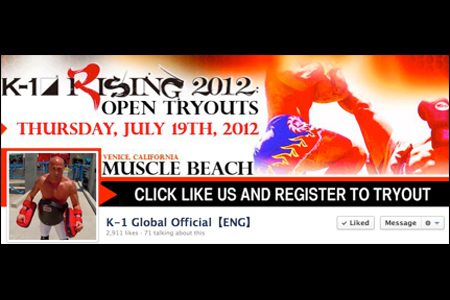 Signing up for the K-1 Open Tryouts is easy – simply visit the K-1 FACEBOOK page. After registering, you will receive your confirmation via email. K-1 is the largest kickboxing promotion in history. Since 1993, K-1 has presented professional live martial arts events in 38 countries featuring the best and most accomplished athletes in the sport. World Grand Prix Champions of K-1 include Alistair Overeem, Mark Hunt, Ernesto Hoost, Peter Aerts, Remy Bonjasky and Semmy Schilt. K-1 has held broadcast deals with ESPN and HDNet in the United States, Fuji TV in Japan, and numerous other networks across the globe. K-1 returned to the world stage on May 26, 2012 in Madrid, Spain drawing a packed stadium and hundreds of thousands of views on the K-1 Live Stream.